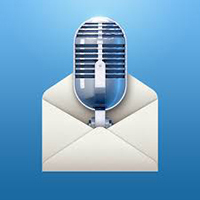 Say it Mail it App Review: The single fastest way to email a voice memo to anyone about anything | West Loh on Leverage, Automation and Outsourcing Strategies, 100% Free! Well, welcome to the Say it & Mail it iPhone app review. This is West and thank you for joining me. Now this app is a really quick way to send yourself or somebody else a voice memo and quickly attach photo, audio or video file. It’s pretty cool. And I thought I’d take you through it today in a really quick tour. So once we’ve said our voice message, we can optionally attach a photo or a video. Now I’ve just taken a quick snapshot there by tapping this button and taking a snap. And that’s a photo of the camera. You can adjust the quality of the photo by sliding this and you can adjust the size by sliding this . If you’ve already got a photo on your album, you can get it from there or you can clear it and restart. I’m going to go ahead and tap DONE. So I’ve already taken the photo. Now this icon here optionally, I can attach a location. So if I tap here, it will ask me if I want to allow it to track my location. And I’ll show you really quickly the map up the top here. So if I tap on ROAD MAP, it will show me the map of where I’m at. Or if I tap SATELLITE, it’ll show me the satellite view of where I’m at. And I can actually attach that to my message, which is pretty cool. If you don’t wish to have that attached, you just slide this across and that won’t do that. So that’s an option for you. This icon here allows you to group emails. So you just need to program the group, people that you’d like to email to and it’ll allow you to do that for you. Other than that, I’m going to mail this by tapping the MAIL. And it just allows you to choose from your inbox who you’d like to send it to. You can see that it’s attached the recording of the voice that I’ve just recorded in there. And also, if I scroll up, it’s attached the photo of the camera. So it’s really quick. And I could also have shot a video which it would have attached as well. So it’s your choice of media that you actually choose. I’m going to cancel that. So all up, it’s a pretty versatile app in what it can send. It’s very focused in what it does and that’s what I love about iPhone apps that I really use and endorse. By the way, if you tap this, it doesn’t do anything. If you tap any of these, it won’t do anything. This resets the message, resets the image. So you’re starting from scratch. But I won’t do that right now. So let me take you through really quick how I use some of the features of this app. Firstly, I like sometimes keeping track of all my thoughts by saying something and emailing it to myself. The beautiful thing about that is it’s stored on your email so you can access it whenever you want. I usually include a subject when I send it. I’ll usually include a specific subject line. And in my email, I have filters set up to automatically store it in a certain audio memo folder. So it’ll automatically do that and whenever I send a memo—whether it be an idea, number, a recipe, anything cool that I see that I want to take note of—I just say it, email it and it’ll store it in that email folder for me. What you’ll find is a really quick way to access something cool. I like to also email screenshots of things that I come across on my iPhone. And the way I can do that is when I’m scrolling through my iPhone, through Safari or wherever it is I see something cool, I can just press the home and the on and off button and it’ll take photos of it. I can actually mail that not only to myself but to other people if I want to include them or let them know or notify them or something. And also include a voiceover commentary or voice message on top of that. So it’s pretty cool. And also, in that there’s no time limit? So you can send files as long as you want. The only thing is it’s about a megabyte per minute. So you need to take into consideration who you’re sending it to and the mode of receiving the message. If it’s going to be another mobile device, you don’t want to be sending a 20MB‑size file. So that is one drawback in that you can’t send two large files. Also, there’s no editing. You can’t edit the message. You’ll notice at the start of the message I said, “So that’s recording…” I’d probably want to remove that but it doesn’t allow me to edit any of that which is a drawback of this app. And also, there’s no option to MMS. It’s primarily focused on emailing it. I think if they included that option, that would increase the functionality of it and be much more usable. But other than that, I really like the app. I’m going to give it an 88%. For its purposes, it serves it really well. It’s super focused and I like the app interface. It’s simple, easy to use and you could just tap SAY IT, say something and email it off to someone and they get it with reasonable quality and in a reasonably quick time. So thanks for listening to this review and we’ll see you in the next video. • Emailed voice memos are compatible with Mac, PC and any other computer O/S (uses compressed wave format). • No file maintenance on your iPhone/iPod Touch, since audio files are not stored there. • NO ADVERTISING in your emails. • Send yourself reminders when you are away from your computer. No typing required. Your email address and subject are autofilled. • Great way to send anyone a detailed email without using the keyboard. Hi West, Nice review on Say It mail it. I bought it! Thanks Monte! good to hear you are harnessing the power of some of these apps, most people don’t have any idea! Will do thanks for the heads up!